What I thought would be an uncomplicated task to purchase timed tickets, turned out to be quite complicated. A week before the exhibit was to close and the paintings sent back to The Hague, I went to the Frick website and discovered it was sold out. As I sat glumly looking at the computer screen, I noticed information about memberships. If I purchased a membership, it would permit me to enter any exhibit at any time, immediately, even the one currently sold out. I’d also be able to stand on a shorter, priority line just for members, much as first class ticket holders avoid coach class lines at airports. According to The New York Times, normally the Frick logs about three new members a day. In the first six weeks of the show, the Frick signed up around 100 new members a day, and during the last few weeks, that number tripled. Since I needed four tickets, I had to join at the Contributing Friends level, a cost of $250. Then I had to purchase Amtrak tickets, also higher priced than usual because our trip was 5 days away and a holiday weekend. All told, I’d end up spending $600, and that didn’t even include the price of lunch. My husband said I was nuts (really, he did). I told him we had to get our grandson to this exhibit. 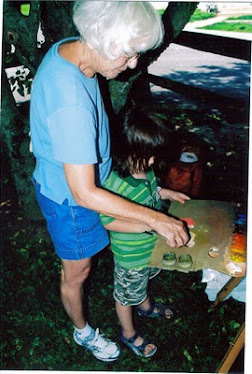 I wanted to be the one who showed him these paintings (yes, ego was involved). My strongest argument: it was still cheaper than taking him to The Hague to see the same paintings. He laughed at that. This past Sunday we left Wilmington at 7:55 am and arrived in New York about 9:40. As we walked up 70th Street, we spied the end of the already lengthy Members’ line—about mid-block from the entrance. Once we lined up, I noticed the “other” line, the one for ticket holders, snaking to the left of the entrance, turning the corner on 5th Avenue, and continuing all the way to 71st Street, where a short time later it turned that corner and continued. Soon the Frick guards started a third line adjacent to the Members’ line: this one for those who did not have tickets, nor were members, but would be purchasing memberships at the door. My grandson and his dad joined us soon after we arrived, and we waited. I tell you this because it illustrates the theme of this post: when genuine interest burns in us, we move heaven and earth to achieve our goal. And I was on fire. Those waiting in line quickly became friends rapt in conversation about our last-minute decision to see the exhibit; several near us, including my son-in-law, walked a few blocks to buy coffee. At 11 am, the guard let all the members in. After us, I heard him say, he would admit the “members to be” and then the ticket holders. Once inside, viewers surrounded the key paintings. They were generous and kind. The mass of people in front of Girl with a Pearl Earring parted like the Red Sea, shepherding my grandson to the front. That’s when I started whispering in his ear. “What do you see first?” I asked. “Why do you think that is? Did it happen or did I imagine it? I felt the entire mass of people behind us move in, like a football game huddle, and some whispers of “light and space” floated backwards. They all were intently following our conversation about the light as it moved our eyes through the space in the painting. Ari noticed the girl’s shoulder bulging forward creating a pyramidal solid mass in the frontal plane. I called it a pyramidal solid mass; he called it a big solid mountain-like thing. The folds in the fabric created a series of rhythmic vertical bands that repeated, closer together and smaller, in the pattern in the darkness on her back. 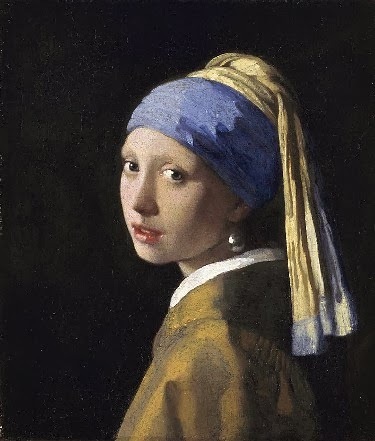 They repeated again in the narrow in-and-out linear folds of the hanging yellow cloth, and again wider and deeper as they met the blue of the turban wrapped around her head. We explored some more. We noticed the dark/light contrast in the pearl: three strokes consisting of a dab of bright white, a semi-circle of indented brown, and an arc of soft gray at its base. “What about the paint surfaces?” I asked. We looked at The Goldfinch, the tiny 13¼ x 9 inch painting by Carel Fabritius, now made even more famous by Donna Tartt’s book. This picture created a challenge simply because of its size. As before, the crowd allowed Ari to move to the front, but even up close, we could not see details. 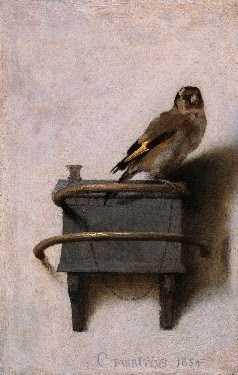 Ari noticed the reversal of light and dark: unlike Girl with a Pearl Earring, in this picture, the darker bird and its feeding box dramatically contrasts with the light background. We enjoyed the intervals between the projecting bars, the bird’s tail sliding behind the top one, while the dangling chain slides behind the larger bottom one. The illusion of bird and feeding box pulling to the right side of the picture, and projecting forward in clear space, with that space further accentuated by the shadow, impressed him. I found impressive the restrained palette of browns, grays, and yellow going from darkness through changing degrees of light and then enlivened by the surprise of muted red on the bird’s head and the bright yellow on the wing. Equally impressive: the thin threads of paint highlighting the semicircular bars and the bird’s feet. We examined the other paintings included in this exhibit, and then we proceeded to explore the entire Frick Collection where I moved Ari through a review of visual ideas and techniques in the traditions of art, a daunting task, you might be thinking, but one I approached like a quest. In the West Gallery, we examined Rembrandt’s brush strokes compared to Hals’ by comparing each of their paintings hanging in the same room. In the Living Hall, we compared the ways Giovanni Bellini and Titian explored Venetian visual ideas, easy to do because their paintings were on the same wall. 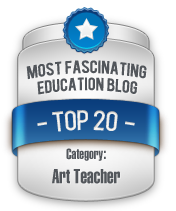 “Why El Greco?” I asked. “Because the figures are so twisted, long, light, and eerie looking,” he said. By the time we arrived at the Enamels Room, I worried my “student” might be weary. 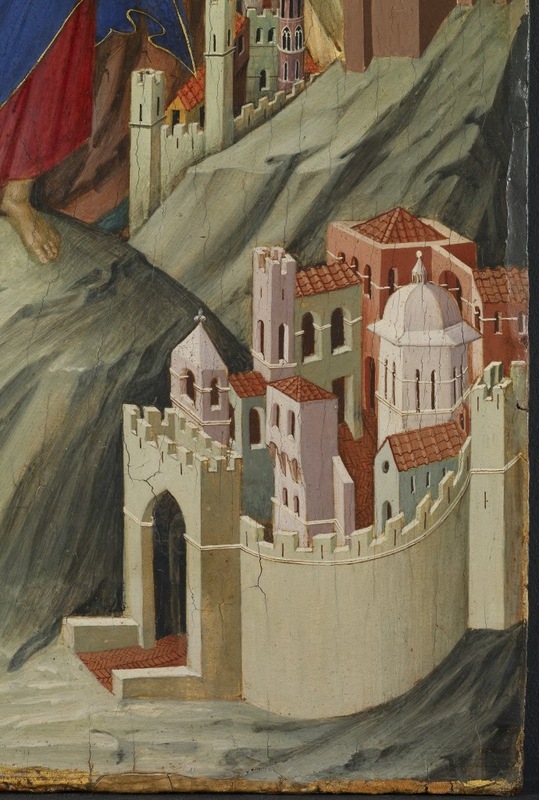 However, Duccio’s The Temptation of Christ on the Mountain, caught his attention. 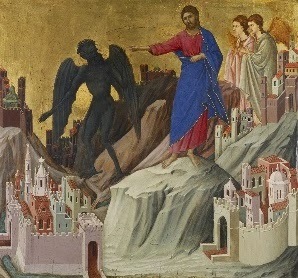 The picture shows a towering Christ rejecting the devil, who offers Him “all the kingdoms of the world” if Christ will worship him. 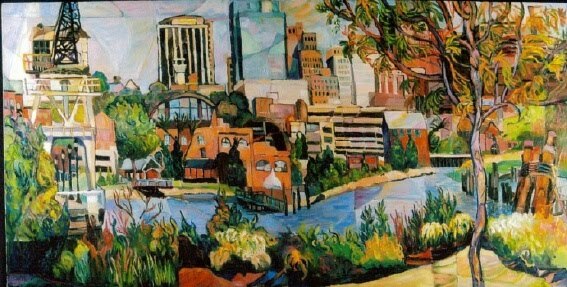 The subject did not impress Ari; the huge figures in relation to the little, pastel pink, blue, white buildings did. “This looks like what I build on Minecraft,” he said. “What looks like it?” I questioned. The “we” refers to him and his cousins: 9-year-old Ari in Emmaus, PA; 14-year-old Josh in Landenberg, PA; and 8-year-old Max in Beverly, MA. 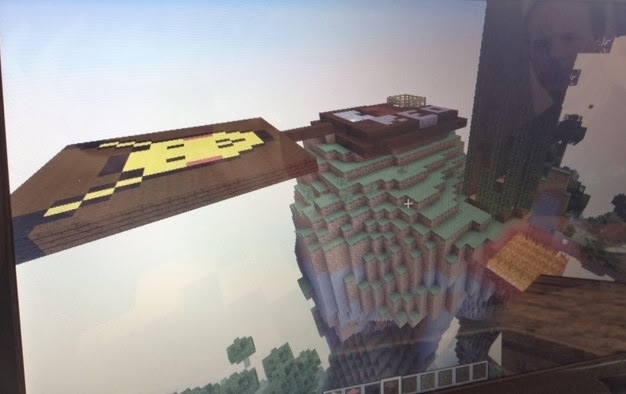 Somehow, they all log on to the same “game” at the same time and build houses, towns and cities while they fight creepers who try to destroy their creations. That’s the clearest explanation I can give you. I have watched the intensity of this endeavor, and I have absolutely no idea what they are doing. 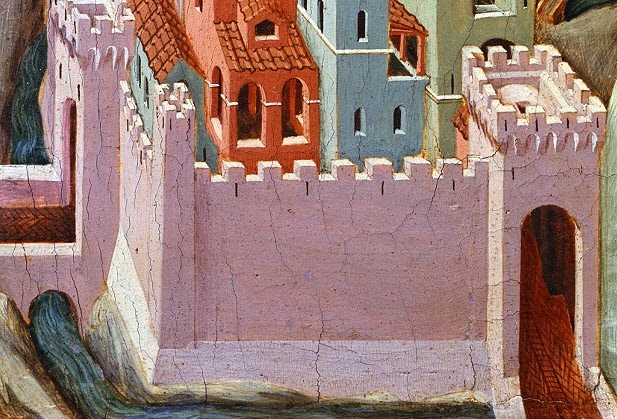 You might argue Ari missed the delight of Duccio’s color-ensembles, the drama of his color contrasts, the intricate spatial relations within the turrets, domes, and crenellations. However, this 21st century child felt excited by visual qualities very much alive and well in a computer game he plays with his cousins. When we left the Frick, we were very hungry. 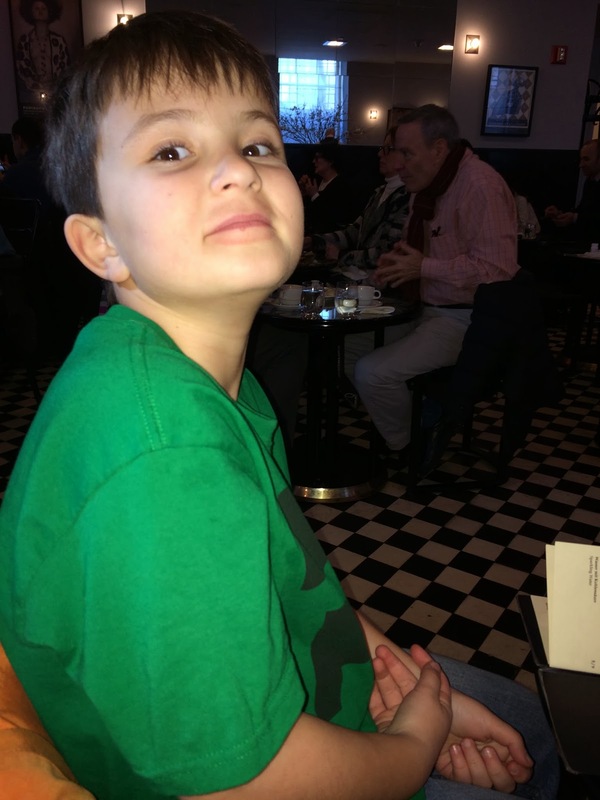 We decided to walk the 13 blocks to the Neue Galerie because there we could eat at either of its two restaurants—both of which served Viennese coffee, pastries, and good food. While we waited for our meal, Ari enjoyed a drink that included house made chocolate milk, vanilla ice cream, whipped cream, and cocoa powder. I took out my cell phone to immortalize the moment just as he turned to face me. 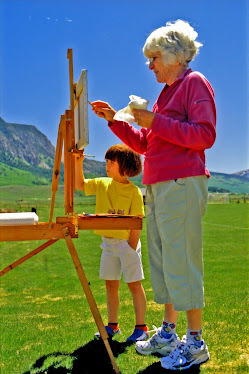 In effect, interest drives curiosity, and when we want to understand the art in paintings, it fuels our efforts and is worth, very much worth, the work involved.